Pop goes the weasel, apparently Carlsberg goes pop too! 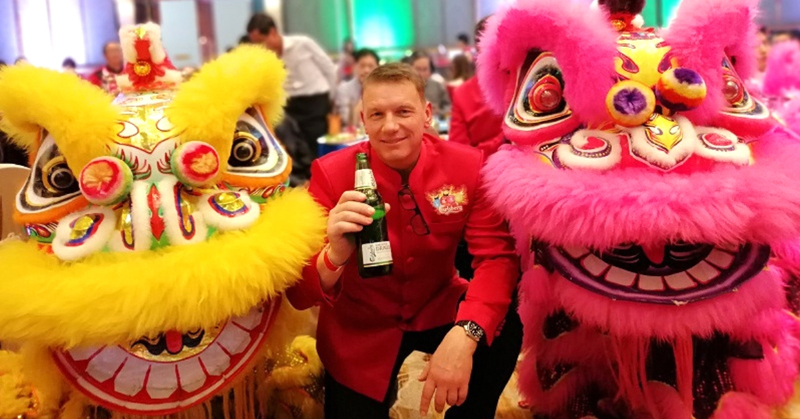 With the New Year having just passed and the Chinese New Year on the horizon, Carlsberg hosted a wonderful and prosperous Chinese New Year event to celebrate Prosperity, Happiness, Wealth and Good Luck in the respective Red, Pink, Green and Blue colours! Officiating the launch gala was none other than Carlsberg’s very own Lars Lehmann, the Managing Director of Carlsberg Malaysia. The event started off on a high note with people laughing, socializing and listening to renowned Feng Shui consultant, Dato’ Joey Yap as he unveils his predictions for the 12 Chinese Zodiac signs in relations to the four main elements of the event starting from Prosperity, Happiness, Wealth and Good Luck! All while enjoying some delicious finger foods, and of course making the most out of the free flow of drinks! From Asahi to Somersby, what’s not to love? Everyone also had a chance to pop a tab and see what they won in a fun mini game! With the grand prize being a literal trolley filled with goodies worth up to RM 800! Sadly, I didn’t win. I did however get a can of Kronenbourg though! With the gala dinner in full swing, we were then treated to amazing performances, starting off with a spectacular lion dance that featured not one, but two lions! As the night continued, it was apparent that Carlsberg held nothing back in order to make the night great for their guests ranging from trade partners to media by inviting multiple local A listed talent such as JieYing Tha! The best part had to be Carlsberg’s record breaking Fund Raising Milestone, raising a total of RM 520,000,000 for schools all around Malaysia! In a campaign that spans three decades, Carlsberg shows no signs of slowing down as they kick start another year with a “pop”! Thank you Carlsberg Malaysia for a great night! Sevenpie wishes everyone a prosperous year in terms of Prosperity, Happiness, Wealth and Good Luck!